Cognitive dissonance describes the difficulty people experience when faced with conflicting attitudes, beliefs or behaviours. This is a bit how it feels running aquaculture or ‘blue bioeconomy’ businesses on terra firma and in untraditional ‘farm’ settings. Bigh Farm in Belgium knows a thing or two about this challenge. 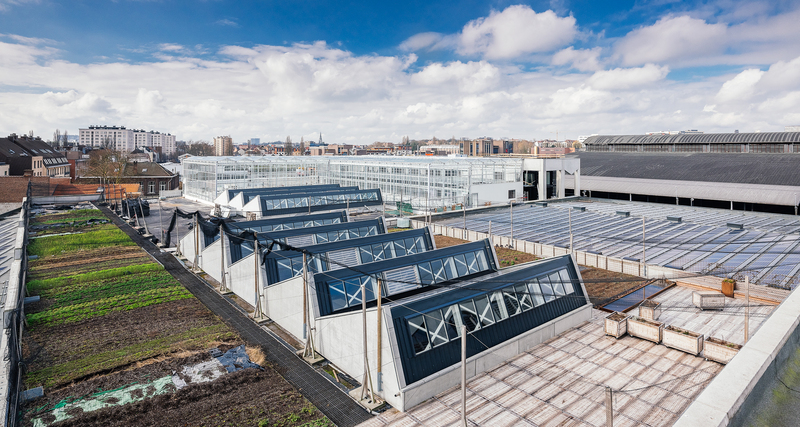 “It takes quite a bit for some people to get their head around our concept … organic and sustainable farming, for example, in industrial zones,” says Bigh’s brainchild Steven Beckers, who runs sophisticated aquaponic greenhouses located on unexploited commercial rooftops or land in urban or suburban environments. He has become an expert in dealing with this ‘dissonance’ also brought on by combining blue bioeconomy principles with other farming activities in urban settings, likening it to an “out of sea experience”. One major consequence of this disconnect is the difficulty he has faced trying to raise finance, in particular public funding, when your businesses runs across several sectors; and the technologies used are sometimes innovative and not that well understood. “Crossing fields like this really does complicate things for obtaining grants and private capital. In fact, the circular economy in general is not always fully appreciated; people agree with the principle, but don’t understand that it touches everything! We rarely get an expert in front of us with a broad enough mindset to aggregate all these elements,” says Beckers. It means Bigh has to go further than many operators to establish its sustainable bioeconomy credentials, for example through clear guarantees that its products are free form GMOs, antibiotics, pesticides and chemicals, that its practices are cradle-to-cradle and respect animal welfare codes (i.e. respectful fish slaughter in its pioneering ‘Ferme Abattoir’), and wider efforts by the whole team to save energy, water and resources throughout. Indeed, aquaculture is complementary to agriculture in unrecognised yet innovative ways. For example, discarded water from the fish enclosures is full of nutrients and can be re-used to water crops on the city farm with no need for additional fertilisers. In this closed loop approach, using antibiotics on the fish is clearly unwise because it would re-enter the food chain. A sometimes overlooked aspect of aquaculture is the treatment and health of fish stocks raised for food, feed and products. Althought public awareness of this aspect of EU animal health policy is starting to pick up. A recent Guardian newspaper piece, including footage from Italian NGOs of fish suffocating slowly, puts the spotlight on an industry described by fish activists as “underwater factory farms”. The article quotes former EU Health Commissioner Androulla Vassiliou on reports that there is now sufficient scientific evidence indicating that fish are “sentient beings” and may feel pain and suffering. A March 2018 report by the Commission raises the possibility of introducing “certain requirements regarding the protection of fish at the time of killing”. It found that practices in several EU countries fall short of the Aquatic Animals Health Code set by the World Organisation for Animal Health. Greater awareness of fish health and well-being is just the beginning, say experts in the sector. It also demands innovative approaches both in fish-rearing and harvesting, in particular to tackle overuse of antibiotics – a cascading health concern leading to a rise in antibiotics resistance. This problem has become so prominent that it was given a dedicated European Antibiotic Awareness Day, on 18 November. Natural, safe and environmentally-sustainable ways of keeping animals healthy in both agri- and aquaculture are possible. One solution developed by Proteon Pharmaceuticals, a Polish biotech company, is to use targeted phage-platform technology which prevents and/or eradicates infectious diseases in animals, humans and plants. Bacteriophages are naturally-occurring organisms in the microbiome. Proteon has trademarked a solution (BAFADOR®) tackling pseudomonas and aeromonas infections in fish. “Our preparation does not disrupt the natural bacterial flora of the fish, and also stimulates defensive mechanisms and resistance in the studied species of fish,” explains Proteon’s CEO Jarosław Dastych in a statement. Last year, the company signed a deal with Aqua-Spark to help commercialise its sustainable products globally, and to further develop its production capacity and bacteriophage technology. “With the growth of antibiotic resistance as a global problem and the increasing demands on animal protein production worldwide, a natural and sustainable health solution, like our products based on bacteriophages, will increase farm efficiency and support food safety,” notes Matthew Tebeau, Proteon’s COO about the deal. Driven by several food-health scares in Europe, the EU pushed forward its animal health strategy under the banner ‘Prevention is better than cure’, culminating in the Animal Health Law of 2013, part of a package of measures enforcing health and safety standards throughout the agri-food chain. See also European Food Safety Authority (EFSA). Today, EU animal health policy covers the ‘health status’ of all animals (livestock, poultry and fish) in the EU raised or managed for food, farming, sport, companionship, entertainment and in zoos. It protects human and animal health and welfare, as well as food safety by controlling animal disease outbreaks and by surveillance and eradication programmes.